When it comes to selling artworks and handmade items online, Etsy is pretty much the standard. True, there are sites like Saatchy Art, but they don’t really sell affordable art. Etsy is different. 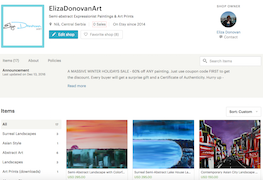 Not only does it make buying and selling artworks (and other unique stuff) safe for the buyer and the seller, but most of the art listed there is more than affordable. I’m very pleased to announce the opening of my Etsy shop. Well, it’s not really the opening because it was there for some time, but now I took the time to make it look nice and added some paintings for sale. So feel free to go ahead and check out my Etsy shop. OK, you might be asking yourself why you should go to my Etsy shop and buy art there when you can buy directly from me. Because right now I’m running a 60% sale for the lucky few first customers. That’s right, 60% off ANY painting. So, see you on Etsy!